RVA Food News: My Noodle preview, late-night vegan tacos + more. 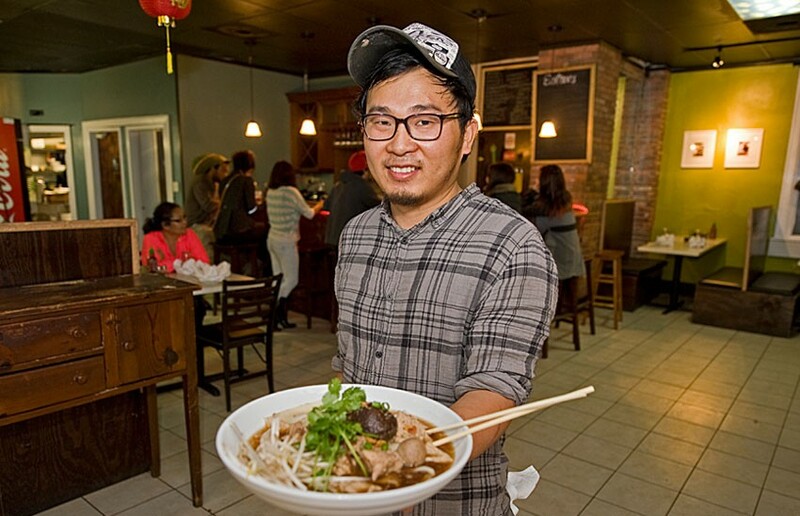 Joe Kiatsuranon shows one of his favorite dishes, the love boat noodle bowl, at his new business, My Noodle & Bar, which opened last weekend on Monument Avenue in the Fan. Anyone who's eaten at Mom's Siam in Carytown will recognize Joe Kiatsuranon as the smiling son who worked the counter. Now he has his own place, My Noodle & Bar, which opened last weekend at 1600 Monument Ave. in the cellar of Stuart Court apartments. Kiatsuranon says he's bringing a new concept to Richmond, focusing on authentic and fusion noodle dishes from Japan, Thailand and Vietnam. With a redecorated interior and all new kitchen equipment, My Noodle is poised to fill a niche while helping others. A portion of entree sales will be used to support English-as-a-second-language programs here. "I used to be one of those students," Kiatsuranon says, "and some of them come to this country with $2 in their pocket, and a lot of them are refugees, so ESL helps them" get established. The business is open weekdays from 11 a.m. to 10 p.m., and an hour later on weekends. It will begin serving an Asian brunch on Sunday mornings in December. 308-1613. Late-night tacos: RVAVegan owner Ed Edge brings tacos to Shockoe Bottom when they're needed most, Thursday to Sunday, 5 p.m.-2:30 a.m. at Café Verde at 1810 E. Main St. Edge uses all of the proceeds from his food truck and the new cafe to support Have Heart, his health-oriented nonprofit. Cupcakes and vegan street food are his specialty, served from a bright pink food truck, catering service and now the green storefront in the former Cobblestone Bakery. rvavegan.info. Beer dinner at Rowland: A four-course feast highlighting the beers of Parkway Brewing Co. is set for Nov. 20 at 6 p.m. at Rowland, 2132 W. Main St. Dinner is $45 and includes seafood, braised lamb shank and chocolate, among other flavors. Brewery owner Mike "Keno" Snyder will play host, with chefs Bruce and Virginia Rowland running the kitchen. rowlandfinedining.com. Weatherproof farm: Cooler temperatures don't hamper the Byrd House renegade market, which runs Tuesdays, 3-6 p.m., with vendors including Agriberry, Deer Run Farm, Faith Farm Foods, Byrd Farm, Bill's Produce/Health Farm, Epic Gardens and Phal's noodles and spring rolls, among other artisanal purveyors. Find out more on the Byrd House Market Facebook page. 239 S. Linden St. There's a Czech saying, "It is better to be in the pub with a beer than out in the world," and it's one of the mottos at the new business the Cask Café & Market, at 206 S. Robinson St. Another is "We're a coffee shop for beer," and a social hub with the lure of a side parking lot, friendly staff and a prime selection of cheeses, bread and cured meats from Sausage Craft. David Garrett, Jason McClellan, James Talley and Shawn O'Hearn bring years of beer and wine experience to the enterprise. Customers can fill growlers (the restaurant has 1,000 ready to sell) and buy hot dogs and sausages by the link to go, or order from a concise menu to dine inside. Salads, sausages, Czech potato salad, pressed sandwiches and cheese and meat boards are designed to complement the flavors of beer. Soups are coming this winter, and Lamplighter coffee is available, with most items in the $5-$10 range. The partners took a former gas station — later a hair salon — and refurbished it themselves, adding windows that fold open, tables for about two dozen guests, and simple wood floors and furnishings. Offering a dozen taps and room to expand, they hope to be an off-premise market for the neighborhood and a place to try new brews and brats in an open-air setting. 206 S. Robinson St. 355-2402. American Tap Room Classic Grill: A new location of the Virginia-based chain opened Monday, serving lunch and dinner daily. 1601 Willow Lawn Drive, unit 840. 308-9013. americantaproom.com. Postbellum: In the former Mulligan's, a diverse lineup of snacks, sandwiches, burgers and entrees from chef Jen Mindell. Daily 3:30 p.m.-2 a.m. 1323 W. Main St. 353-7678. postbellumrichmond.com. Divine Creperie and Wine Bar: Seasonal small plates and entrees with fine wines for weekday lunch and dinner nightly except Sunday. 13127 River's Bend Blvd., Chester. 571-6383. divine-rb.com. Kobe Sushi at Stony Point: Specialty rolls, tempura and Japanese classics, with lunch and dinner specials daily. 9200 Stony Point Parkway. 323-3333. kobesteakandsushi.com. Big's BBQ: Dry-rub barbecue and sides in counter-service cafe. Lunch and dinner daily, 11 a.m.-10 p.m. 931 W. Grace St. 257-5460. bigsbbqva.com. Crustacean Boil N' Grill: Crab, clams, oysters, catfish and other specialties, including a classic crawfish boil served in a bag. 8906 W. Broad St. 404-2412. Burger Bach: Raw bar, New Zealand beef and lamb burgers and fries, craft beer and wines, sports on screens. 2225 Old Brick Road. 716-6748. burgerbach.com. Max's on Broad: Belgian-French brasserie with seafood, crepes, chowder, sandwiches, entrees. Lunch, dinner and bar daily 11 a.m.-2 a.m. 305 Brook Road. 225-0400. maxsonbroad.com.